The last of the three giants who had assumed this great responsibility was however Arumukha Swami. Born in 1865, from his 45th year, for thirty years from 1910 to the 7th of June 1940 when he laid down this life, he laboured singly and devotedly. It is said that he took this pledge of service in the sanctum before Dakshinamurtj in the second prakara of the temple. He started his labours in right earnest. The Kandamadana sandstone-rock was further carved into to form the three mighty prakaras. The erstwhile sandstone pillars were replaced by highly ornamental and sculptured ones, and almost a brand new temple emerged as a result of his continuous labours of three scores of years and, twelve from the very start. To augment the Tiruppani Hundial offerings and speed up the rapidly progressing work, the Devasthanam executives have been financing the Swami regularly at the rate of Rs. 15,000 a year to an extent of about three lakhs of rupees. He was also helped with an amount of Rs. 16,000 by Śrī K. E. P. Venkatachalam Pillai of Tuticorin for the construction of the frontal Airavatha Mantapa of Shanmukha in the first prakara. The displaced airavathas could still be seen stacked outside, and are well worth conservation. The garbha-griha and ardha-mandapa of the central sanctum, the Valli and Teyvayānai shrines, their vimānas, the flooring of the two circuits, and the completion of the temple walls were the major pieces of work of this period. He had also renewed the Gopuram of five storeys over the eastern entrance of the second circuit. The Swami was however very careful with his finances. With the amount of Rs. 36,446 accumulated in his hands, he purchased in 1932 for Rs. 30,000 (on Tiruppani account), the Mitta villages of Timmarajapuram and Makilammalpuram; and for Rs. 6,300 on 20-11-1935 the Dalavoipuram village. The annual net income from their kist collections amount to about Rs. 2,530_12_8. He had also purchased other properties from time to time. 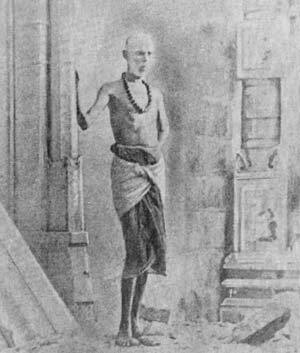 The Swami had now laboured for nearly 24 years, and he began to feel the weakness of age and seriously thought of one who could rightly step into his place and continue his work. He had completed yet another vast work, the commodious Vellaikkal Mantapa of 96 pillars, 115-1/2 feet long and 46-3/4 feet wide. It faces the sea. The stones and pillars taken out of the old temple construction were not wasted but used up in its construction. There is yet a vast collection of such stones imbedded in the sand dunes round about the Nazhik-kinar and near the Shanmukha Vilasa, which could be used up for extending the Mantapa on both its sides to the south and the north.